The Basque language seems inscrutable! When you first look at Basque language it appears an unfathomable language full of X’s, Z’s and K’s – all those letters that you don’t want to be left with after a game of Scrabble! It is so totally different from any other language and where, in Europe, a drop of ‘milk’ is easily come by with a stab at the Latin ‘lait / leche / latte/ leit’ family or a flirt with the Germanic siblings ‘milk / milch / mjolk / maito’ etc. Basque refuses to be put into any mould. Last summer I found a group of puzzled guests around the breakfast room table, black coffees in hand, debating over the possible contents of a carton of ‘esnea’ in the fridge. The origin of the Basque language still baffles linguistics. However, it is an undoubtedly charming, lyrical language, with a strong oral culture and a much loved tradition of spontaneous rhyming bards (Bertsolaris)! 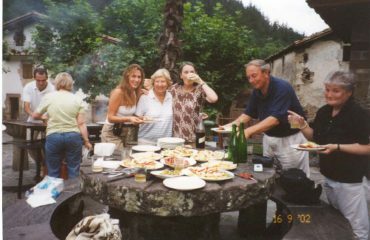 My first introduction to the Basque language was here in the mountain hamlet of Ameztia, bringing up my daughter, Marion, with the help of the local crofters and shepherds. And so my first Basque was baby Basque – or so I thought! ‘Tto-tto’ (dog) was the first word Marion uttered as we walked off through the rain and drizzle ‘txiri-miri’, jumping ‘plisti-plasta’ through the puddles en route to the neighbouring farm where Irune would then whip Marion off upstairs for ‘putxu-putxu’ (a bath) before a bit of ‘ñan-ñan’ and ‘lo-lo’ (lunch and a siesta)! At this stage I presumed I was in the easy, colourful realm of children’s Basque: of onomatopoeias and catchy ideophones that coaxed Basque children into their first spoken sentences. Something akin to the ‘splishy sploshy’ world of ‘wow wows’ and ‘choo choos’ of my own early childhood. However, when the village school in Ituren was officially named the ‘Pulunpa School’ (literally the ‘ding dong’ / ‘ring ring’) school (after our ‘bell-ringing’ carnival personalities the ‘Joaldunak’) I had second thoughts! 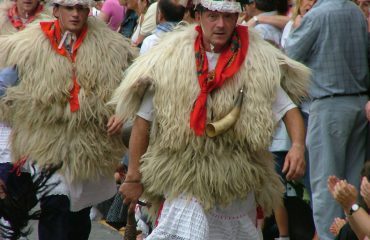 For children and adults alike Basque is full of the most wonderful onomatopoeias and ideophones* which are used daily. I have collected a few here after a really fun conversation with the locals as well as the 86-year-old Amatxi next door, which had her bright-eyed and giggling as she tried to explain what some of them meant. (See list below). STOP. I am sorry but a blog on the quirks of the Basque language, is not complete without my mentioning that Marion’s very first piece of homework when she started school at the age of 3, was to collect all the different ways of saying ‘come here’ in Basque to the various animals on the farm. Where, I think, in English, we would just say ‘come’ or ‘come here’ this is what happens on a Basque farmyard in Ituren! 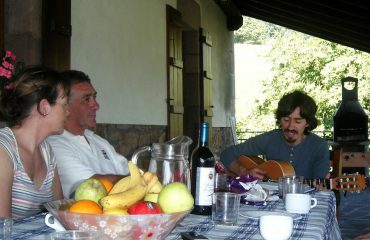 AND, I promise, I was about to leave this article here but Isidro, Amatxi’s son, stopped me on the way out of the farm. Did I know, he asked, that there is a different word to describe each and every animal on heat too? You are not off the hook yet – I will be back with more! A far-from exhaustive list of onomatopoeias and ideophones in the Basque Language. Tilín-talan – swinging backwards and forwards (i.e. bells or a see-saw). Ttal-ttal (egin) – to beat eggs etc. 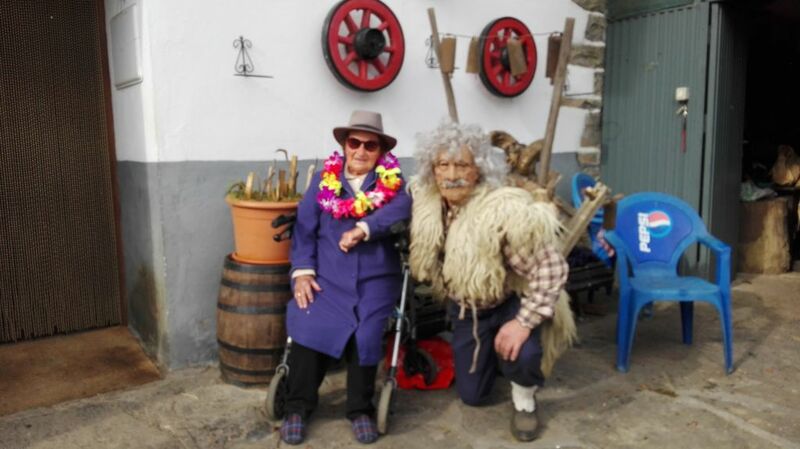 Tuku-tuku – a word used about the people of the Baztan valley and their soft spoken ways of getting what they want! Zintz (egin) – to blow one’s nose. A pig on heat is ‘inaus’, a cow is ‘susara’, a sheep is arkara, a cat, dog, horse or rabbit is ‘iel’. Which word do you think the Basques use (pejoratively) for a woman?